The more that you read, the more often you hear "live from the heart, go within". What does that actually mean and how do you do it? What it means is that we need to stop thinking and begin to FEEL. We complicate everything by thinking. Life isn't meant to be hard. Unfortunately, it's all of the untruths that have taught us to complicate everything. The more that you learn to live from your heart, the easier it gets. Remember that your subconscious mind is like a super computer and it's a record of your past. It keeps you out of this NOW moment by constantly reminding you of that past. It's where your ego lives. It uses logic and logic is based on fear. Our reality is not logical. If it were, then science would have all of this figured out. We must begin to live from love, not fear. Each morning, before you even open your eyes, try to be in this NOW moment. Take a deep breath and focus on your heart. That will automatically bring you to NOW. Do you realize that the heart is the first thing that is developed in the body? Your heart is 5000 times, magnetically stronger than the brain. We are magnetic and we attract. There is actually a large energy field that surrounds your heart, which makes it much more powerful to live from the heart than it is to live from the mind. Your heart is where your true feelings are. 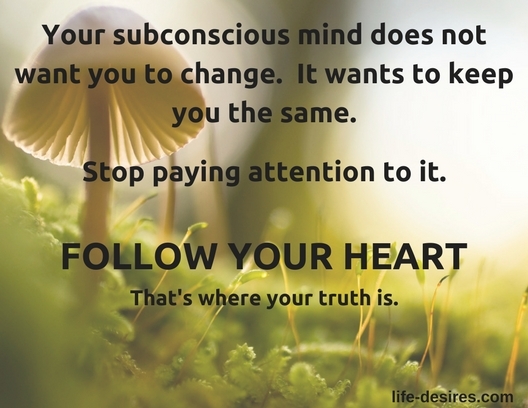 Your subconscious mind will lie to you all day long because of all the untruths that it has been told. The heart never lies to you, which is why they tell us to go within. The mind tells you that you're alone, but your heart will let you know that everything is connected and you are never alone. When you live from the heart, it's your connection to your own soul, your higher self, angels and guides. When you live from the heart your life will be filled with much more love. When you live from the heart, you don't have to think, but that idea scares the hell out of humans. That's not what we have been taught. I wrote a little story on my manifesting page that explains this pretty clearly. A while back our son needed some temporary help on his truck payment. As parents often do we decided to help, but it just didn't FEEL right to me. That was my heart sending me a clear message, but I didn't listen. I allowed my logical mind to tell me that we love him, so we have to help him. This is one area where we have things twisted. I heard someone channel Jesus and Jesus said that we have "everything backwards and upside down" and we really do. I believed that helping our son was "right" when actually it wasn't. We were not allowing him to have his own experience. Not only that, but it was taking me off my own path. This is where self love comes in. When it doesn't feel right, we have to learn to pay attention. Your soul communicates with you through your heart. 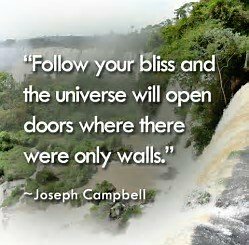 Allow your soul to guide you. It knows why you're here. It knows your purpose. It takes you out of fear into love. The story above taught me that. The funny thing is that all I had to do was realize my "wrong turn" and the Universe fixed it. Not just for me, but everyone involved. Abraham-Hicks has said it hundreds of times. "If you can find a way of feeling better before anything is fixed, Law of Attraction will fix those things." We have to understand that we are no longer in "survival mode" like we have been for thousands of years. With ascension we are becoming our divine selves. We are becoming our own soul. Forgiveness will heal your heart. Someone described the heart as a lotus blossom that opens up with forgiveness. Forgive yourself and then forgive others. Meditation gets the mind out of the way and allows you to live from the heart. It's actually more about breathing and just relaxing. If you hate meditation like I do, just breathe deeply. It brings you back to the heart and to this NOW moment. Genuine appreciation and gratitude will open your heart and increase the heart coherence. Appreciation and gratitude are not compatible with illness, poverty or any other uncomfortable states. Compassion comes from the heart. Compassion allows us to live in unity. Practice forgiveness, give up judgements, reach for understanding, rather than criticism. Know that your heart is like a message center. If you pay attention, you will FEEL what's true for you. Here's a simple technique that you could try. Focus your attention on your heart and breath a little deeper than normal. Breath in for 5 or 6 seconds and out for 5 or 6 seconds. Hold a positive feeling as you do this. It could be the first time you met someone or the day that your child was born. It could be a special moment that you shared with someone. Make it something that you truly love and appreciate, as you do your breathing. Do this a few times each day. If it helps to focus, place your finger in the center of your chest or put your hand over your heart. A video by Teal Swan about living from the heart. Do you believe that what you see is reality? The truth may surprise you. Another page that may be important is We Are Vibration. As an Amazon associate I do earn a small commission on qualified purchases.